Whenever you shop on smile.amazon.com .5% of your purchase will go directly to Shaloh House Chabad! 1. Click on the AmazonSmile link above. 2. 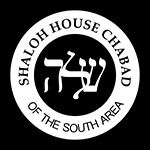 Select Shaloh House Chabad as your charitable organization.